Hakeem has threatened to not pitch for his date with Cleo in the Rendezvous Room tomorrow afternoon. 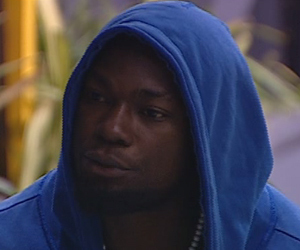 The Zimbabwean Housemate made this emotional declaration after Maria told him that Cleo refused an offer to be moved to the Diamond House to join Hakeem. Whether this morsel of information Maria saw fit to pass on is true or not, remains a mystery. When the Diamond House Store Room doors flew open to reveal the Housemates who were moving in, Hakeem looked on with anticipation and excitement written all over his face. Unfortunately, his dreams were shattered into a million tiny little pieces when Maria and Neyll walked in, instead of Cleo. Maria then cornered an upset Hakeem later and told him how Selly had asked Cleo if she wanted her to send her to the Diamond House. "She turned down the offer and said she doesn't want to live in the same House as you," Maria said without missing a beat. An inconsolable Hakeem didn't want anyone to touch him as he lay in bed dealing with the slight. Later on, he headed to the garden where he opened up about his pain to his boys. "Cleo changed her mind at the last minute. We could have spoken about it if she was having second thoughts about us but instead she chose to make that decision on her own. Tomorrow she will be in the Rendezvous Room alone", he said. Bimp urged Hakeem to rethink his decision. "Don't do anything out of emotion", he said. Nando, who was a little too happy courtesy of the alcohol he, Bimp and Bolt had stashed last night, told him as a matter of fact. "We voted for you and Cleo to go to the Rendezvous and that’s where you're going. Go in there and tell her what you heard and then take it from there. You're the man so you have to show up. You run this," he said as he splashed about in the Jacuzzi. This is not the first time Maria has found herself in the mix in as far as other people's relationships are concerned. She and Natasha knew every morsel of information surrounding the LK4, Beverly and Koketso situation and they were not afraid to update the players in this particular love triangle with the lastest gossip. Is she trying to stir up trouble or does the petite Namibian have Hakeem's best interests at heart? Maria,that was a mean thing 2 do,telling Hakeem! This ngeti chick is nt being honest..cleo askd maria 2 tell hakeem the whole story..she didnt do anytng wrng..
Stop tryng 2 make maria look bad in this situation..cleo askd her 2 tell hakeem..and said she did 4 his own good..
hakeem get another gal just. Hakeem is such a pain. Did he come with Cleo in this game. He must keep his eyes on the prize. Is he the first person to love in this game? Fwiiiii man. I hope her boyfriend is watching. Maria is a liar and she won't build a family. I told u guyz frm day one! Hakeem want Cleo but She is playing along.see her putting her legs on Oneal's shoulder in JACUZZI,dancing wt her swimmn pants wt d guyz! She wants to play d game well n I tink she listend to wat Oneal told her b4 d Swap.Africa we are d ones matching them.Hakeem is seeking attention. Not only 22,his is 12.mtcheeeeeeew!heard him say he has a child or even 2kids? Plz African aren't fools!!! @anonymous11:23 age cheat is common wit africans.hakeem is not 22yrs dats an official age.wen I see a 22yrs old guy I will knw.hakeem is jst a cheat.D guy is begining to bore me.